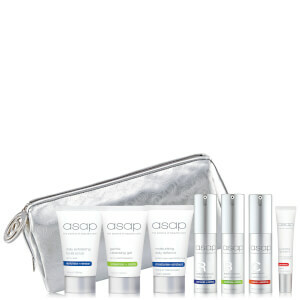 The AGE Smart Starter Kit contains a full month's regimen you can use every day for firmer, smoother, healthier skin. 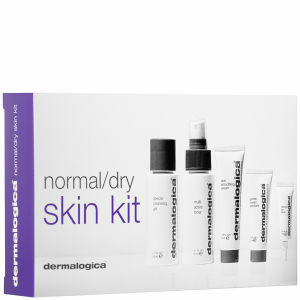 Use morning and night, or as directed by your Dermalogica Professional Skin Therapist. Cleanser: Lightly lather in hands and apply to damp face and throat morning and evening, massaging with light, upward strokes for at least 30 seconds, avoiding the eye area. Reduce to one use per day if any sensitivity develops. Follow with Dynamic Skin Recovery SPF50 when used in the morning. Hydramist: After cleansing, spritz directly onto face and neck, avoiding the eyes. Also ideal as a refreshing spritz over make-up throughout the day. Masque: Apply generously to cleansed face and throat, avoiding the eye area. After 10 to 15 minutes, gently yet thoroughly rinse with warm water. Apply once per week or whenever the skin requires a soothing remedy. Firm: Smooth around eyes, concentrating on areas of visible ageing. MAP-15: To use as a spot treatment, dispense a small amount onto fingertip and blend into skin on areas where signs of ageing are prominent, such as the eyes and mouth areas, prior to application of MultiVitamin Power Firm. Recovery: After cleansing and toning, apply a generous amount to face and neck, preferably 30 minutes prior to sun exposure. Renewal: Apply to lips at least two times a day for lip health maintenance, or more frequently in periods of dryness or environmental exposure. Cleanser: Water/Aqua/Eau, Sodium Laureth Sulfate, Lactic Acid, PPG-2 Hydroxyethyl Cocamide, Cocamidopropyl Betaine, Polyacrylate-1 Crosspolymer, Glycol Distearate, Caprylic/Capric Triglyceride, Tocopheryl Acetate, Sodium Hydroxide, Disodium EDTA, Phenoxyethanol, Caprylyl Glycol, Ethylhexyl Glycerin, Hexylene Glycol, Titanium Dioxide (CI 77891), Citronellol, Eugenol, Geraniol, Limonene, Linalool, Citrus Medica Limonum (Lemon) Peel Extract, Helianthus Annuus (Sunflower) Seed Oil, Rose Damascena Flower Oil, Eugenia Caryophyllus (Clove) Flower Oil, Aniba Rosaeodora (Rosewood) Wood Oil, Citrus Medica Limonum (Lemon) Peel Oil, Pelargonium Graveolens Oil. Hydramist: Water/Aqua/Eau, Butylene Glycol, PEG-40 Hydrogenated Castor Oil, Arginine/Lysine Polypeptide, Aloe Barbadensis Leaf Juice, Sodium Lactate, Sodium PCA, Sorbitol, Proline, Dipotassium Glycyrrhizate, Methyl Gluceth-20, Camellia Sinensis Leaf Extract, Sodium Carboxymethyl Beta-Glucan, Lecithin, Magnesium Ascorbyl Phosphate, Tocopherol, Palmitoyl Tripeptide-5, Bambusa Vulgaris Leaf/Stem Extract, Pisum Sativum (Pea) Extract, Glucosamine HCl, Glycerin, Disodium EDTA, Capric/Caprylic Triglyceride, Leuconostoc/Radish Root Ferment Filtrate, Citronellol, Eugenol, Geraniol, Limonene, Linalool, Citrus Medica Limonum (Lemon) Peel Extract, Helianthus Annuus (Sunflower) Seed Oil, Rose Damascena Flower Oil, Eugenia Caryophyllus (Clove) Flower Oil, Aniba Rosaeodora (Rosewood) Wood Oil, Citrus Medica Limonum (Lemon) Peel Oil, Pelargonium Graveolens Oil. Masque: Palmitoyl Oligopeptide, Palmitoyl Tetrapeptide-7, Chondrus Crispus (Carrageenan) Extract, Arginine/Lysine Polypeptide, Camellia Sinensis Leaf Extract, Chamomilla Recutita (Matricaria) Flower Extract, Avena Sativa (Oat) Kernel Extract, Hydrolyzed Soy Protein, Phospholipids, Retinyl Palmitate, Ascorbyl Palmitate, Linoleic Acid, Beta-Carotene, Lactic Acid, Olea Europaea (Olive) Fruit Oil, Hydrogenated Olive Oil, Dimethicone, Vitis Vinifera (Grape) Seed Extract, Citrus Medica Limonum (Lemon) Peel Extract, Glycyrrhiza Glabra (Licorice) Root Extract, Symphytum Officinale Root Extract, Arctium Majus Root Extract, Anthemis Nobilis Flower Oil, Sodium PCA, Allantoin Decylene Glycol, Menthoxypropanediol, Potassium Cetyl Phosphate, Sodium Polyacrylate, Ammonium Glycyrrhizate, PPG-15 Stearyl Ether Benzoate, Polysorbate 20, Propylene Glycol, Carbomer, Schlerotium Gum, Disodium EDTA, Aminomethyl Propanol, Phenoxyethanol, Annatto (CI 75120). Firm: Cyclopentasiloxane, Bis-Diglyceryl Polyacyladipate-2, Dimethicone Crosspolymer, Cetyl Ethylhexanoate, Polylactic Acid, Tocopheryl Acetate, Caprylic/Capric Triglyceride, Camellia Sinensis Leaf Extract, Chamomilla Recutita (Matricaria) Extract, Spilanthes Acmella Flower Extract, Corallina Officinalis Extract, Carthamus Tinctorius (Safflower) Seed Oil, Vitis Vinifera (Grape) Seed Oil, Ascorbic Acid, Glycyrrhetinic Acid, Boron Nitride, Retinyl Palmitate, Tocopherol, Hydrogenated Soybean Oil, Benzyl Alcohol, Flavor/Aroma. MAP-15: Water/Aqua/Eau, Glycerin, Silica, Magnesium Ascorbyl Phosphate, Phospholipids, C9-15 Fluoroalcohol Phosphate, Hydrogenated Lecithin, Sodium Hyaluronate, Glucosamine HCl, Algae Extract, Yeast Extract, Saccharide Isomerate, Camellia Sinensis Leaf Extract, Nelumbo Nucifera Flower Extract, Saccharide Hydrolysate, Magnesium Aspartate, Glycine, Alanine, Creatine, Polymethylsilsesquioxane, Silica Dimethyl Silylate, Silica Silylate, Vinyl Dimethicone/Methicone, Silsesquioxane, Dimethicone/Vinyl Dimethicone Crosspolymer, Urea, Ethylhexylglycerin, Hexylene Glycol, Caprylyl Glycol, Sorbic Acid, Potassium Sorbate, Propylene Glycol, Sodium Citrate, Phenoxyethanol. Recovery: Avobenzone (3.0%), Octinoxate (7.5%), Water/Aqua/Eau, Ethylhexyl Methoxycinnamate, Butylene Glycol, Carthamus Tinctorius Oleosomes, C12-15 Alkyl Benzoate, Cyclopentasiloxane, Glycerin, Butyl Methoxydibenzoylmethane, Dimethicone, Dimethyl Capramide, Palmitoyl Tripeptide-5, Aniba Rosaeodora Wood Oil, Rose Flower Oil, Pelargonium Graveolens Flower Oil, Helianthus Annuus Seed Oil, Eugenia Caryophyllus Leaf/Flower Oil, Citrus Medica Limonum Peel Oil, Saccharomyces Cerevisiae Extract, Citrus Medica Limonum Peel Extract, Camellia Sinensis Leaf Extract, Algae Extract, Dipotassium Glycyrrhizate, Lecithin, Glucosamine HCL, Arginine/Lysine Polypeptide, Tocopheryl Acetate, Squalane, Sodium Hyaluronate, Polysilicone-11, Glycine Soja Protein, 1,2-Hexanediol, Caprylic/Capric Triglyceride, Cetearyl Alcohol, Stearic Acid, Ceteareth-20, Sodium Polyacrylate, Hydroxyethyl Acrylate/Sodium Acryloyldimethyl Taurate Copolymer, Sodium Acrylates Copolymer, Decyl Glucoside, Polysorbate 80, Urea, Galactoarabinan, Glyceryl Polyacrylate, Polysorbate 60, Aminomethyl Propanol, Disodium EDTA, Phenoxyethanol, Ethylhexylglycerin, Linalool, Eugenol, Limonene, Geraniol, Citronellol, CI 77891. Renewal: Bis-Diglyceryl Polyacyladipate-2, Ricinus Communis (Castor) Seed Oil, Synthetic Beeswax, Tocopheryl Acetate, Di-C12-15 Alkyl Fumarate, Euphorbia Cerifera (Candelilla) Wax, Theobroma Cacao (Cocoa) Seed Butter, Lauryl Lactate, Arginine/Lysine Polypeptide, Palmitoyl Oligopeptide, Persea Gratissima (Avocado) Oil, Oryza Sativa (Rice) Bran Oil, Triticum Vulgare (Wheat) Germ Oil, Butyrospermum Parkii (Shea Butter), Sodium Hyaluronate, Carthamus Tinctorius (Safflower) Seed Oil, Safflower Oil/Palm Oil Aminopropanediol Esters, Squalane, Ethylhexyl Palmitate, Silica Dimethyl Silylate, Butylene Glycol, Tribehenin, Sorbitan Isostearate, Stevioside, PEG-40 Hydrogenated Castor Oil, VP/Eicosene Copolymer, Benzyl Alcohol, Flavor (Aroma). 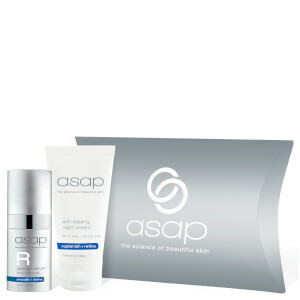 I love the Age Smart Skin Kit. It gives me all of the products I love for a great price. It would probably be more economical to purchase the larger sizes but I find this kit lasts me over a month using it morning & night. It's also a great way to trail the products to see if they suit. 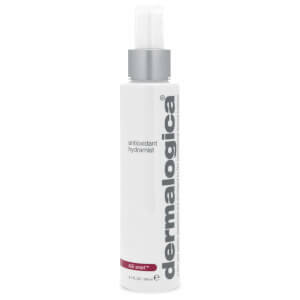 This dermalogica product has been amazing, I bought it for my mum who has become unhappy with her skin in hope that she may feel a bit better about it and I would 100% recommend this product to anyone with aging skin, it looks more malnourished and better in only a couple goes. Loving this skin kit it's the perfect size with a good choice of products so I could trial this range to see if it suited my skin. I have fairly sensitive skin and it feels great and soft after using my kit. The only downside is that it doesn't come with a night cream but otherwise loving it.